A 6-year-old boy was attacked by a coyote that attempted to drag the child away at an Irvine park on Sunday, according to the Orange County Register. This is the third reported coyote attack in Irvine&apos;s Woodbridge neighborhood in the past couple months. The attack happened on Sunday evening, at around 7 p.m., while a father and his two young children were playing at a small neighborhood park in Woodbridge. Apparently unprovoked, the coyote bit and held on to the 6-year-old boy, and dragged the child approximately three feet. The father leapt up and grabbed a hold of the child, prompting the coyote to let go. The coyote, however, stayed in the park. Neighbor Haseena Habibi heard the father&apos;s shouting, and came rushing to the park where she saw the coyote approaching the other child, a smaller toddler. Habibi threw both of her shoes at the animal, but it didn&apos;t leave until Habibi started throwing sand from the playground at the animal&apos;s face. The animal ran away afterwards. After the attack, the child was treated with first-aid for some puncture wounds that did not require hospitalization. A victim of another attack in Irvine in the past few months was similarly treated at the time. Following this attack, California Department of Fish and Wildlife captured and euthanized four coyotes in the Irvine neighborhood, similar to what officials in Montebello did earlier this year following a spate of attacks in that city. Officials stopped trapping on Thursday morning, reasonably sure they had trapped the coyote responsible for the most recent attack. Nevertheless, coyotes shouldn&apos;t really be attacking humans. In theory, they&apos;re supposed to be afraid of us. "Scientists are still trying to figure out if what the coyote is doing is seeing the person as a food source, or if they are trying to remove them from the location," said Capt. Rebecca Hartman with the California Department of Fish and Wildlife, to KABC. Coyote attacks in urbanized areas are becoming increasingly common. Aside from the attacks in Montebello, sightings and attacks have been reported all over Southern California. A family of coyotes was even found squatting inside an abandoned home in Glendale. Though some argue that the coyotes are moving to built up areas after land development displaced them from their natural habitat, coyotes have been spotted living in deeply built up parts of the city, far away from the undeveloped foothills where they traditionally have lived. Though anecdotal, this writer has definitely watched coyotes run through the streets late at night in both Koreatown and Westlake. Woodbridge, the Irvine neighborhood where the most recent attack happened, is likewise in the middle of Irvine, miles from undeveloped land. 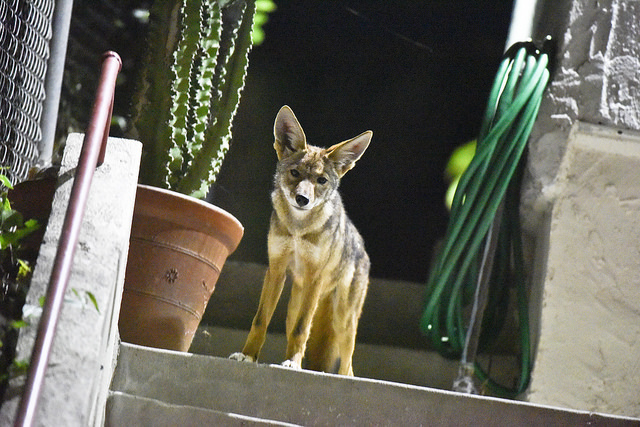 A study initiated by the National Park Service, titled the L.A. Urban Coyote Project, is attempting to learn more about Southern California&apos;s urban &apos;yotes by tagging and tracking animals found living in built up areas. While the study is in its early stages, there are way more coyotes living in L.A. than scientists originally thought there would be. Certainly, coyotes in Koreatown are cool from a natural science perspective, the animals are viewed as pests and dangers by people who have to regularly deal with them around their homes. If you happen to encounter a coyote, try to scare it away by making loud noise and (if possible) running towards it. Coyotes will only continue moving in to urban environments if they perceive the humans they live around as non-threatening.